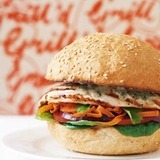 Grill'd is a fast food restaurant but is far unlike the mediocre offerings of some other 'fast food giants'. The food is all fresh, real, good quality food. The kind of food that you wished was served any time you felt in the desperate need for chips and a burger. Apparently they even bake their breads in the stores. My favourite burger is the Caesar's Palace burger. It is a little pricier than many other burgers at about twelve dollars but I am not sure I would be able to make this at home for any cheaper. It is like having a Caesar salad but in burger form. Nothing and I repeat nothing can beat this burger. The meat is real breast chicken than has been cooked on a grill so that it has a nice tender juicy but above all smoky flavour. It also has a crunchy piece of bacon, real Cos lettuce leaves, cheese, their own herbed mayonnaise and of course the obligatory egg. This burger is so large it has to be held in place with a wooden skewer, which can sometimes mean that when eating it you accidentally end up dripping the mayonnaise juices all over the plate. This can be good because then you have something to mop the chips up with. They have lots of other burgers with great flavours like the Mighty Melbourne with its beef burger, or the Zen Hen which had chicken and a satay sauce with coriander and carrot for that Asian burger experience. They also have steak sandwiches and even salads if you are so inclined. And as a plus side for any vegetarians or people who have vegetarian friends/family they also sell vegetarian burgers which look so good sometimes I even get tempted to try them. So far I always keep returning to that irresistible burger, The Caesar's Palace. I hope one day to try them all but somehow each time I enter into Grill'd I can't help it and return to my favourite. The chips are also one of the best parts of coming to Grill'd, not only are they the nice thick crispy chips, but they are also covered in rosemary and salt which gives them a really savoury flavour. They also sell little tubs of sauces for the chips to dip into, my favourite is the herbed mayonnaise. They taste so delicious I am almost tempted to buy two tubs but I try to hold myself back. It is a hard struggle which keeps getting harder. It is also a great place to bring kids to, they have a children's meal which includes a mini burger, a small chips and a juice with some pencils and paper to draw on. This meal is good because it has all those fresh ingredients but which can also appeal to an adult's taste buds. I have sometimes taken my nephew here for visits and each time he has loved it, which has made feeding him a lot easier than it sometimes is. You don't know what a struggle it was to get him to try the croissants - which he then loved. So it is nice to find a place that tastes good for the both of us. Why? Fresh food, tastes great and it is a burger place.